Forever Darling casts Desi Arnaz as Lorenzo Xavier Vega, a brilliant scientist and Lucille Ball as Susan Vega, his neglected wife. Wishing out loud that her husband would pay attention to her, Susan is surprised to find her Guardian Angel standing in her living room. Even more surprising is the fact that said angel is an exact double for Susan's favorite movie star, James Mason. Following the angel's advice, Susan tags along when Lorenzo takes a trip in the woods to test out a revolutionary new insecticide. Hoping that the trip will constitute a second honeymoon, poor Susan is in for a major disappointment; as for Lorenzo, he must suffer his wife's well-intentioned "assistance," which of course is no help at all. After a number of I Love Lucy style comic situations, the couple is on the verge of divorce, but the angelic Mason straightens things out. 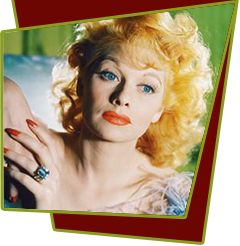 Special Notes: When Lucille Ball and Desi Arnaz beat the odds against TV stars succeeding on the big screen in The Long, Long Trailer (1954), MGM contracted America's favorite couple for a second theatrical feature. Forever Darling tanked at the box office, but at least Desi Arnaz cultivated a hit song by recording the title tune.